Search Engine Optimization (SEO) is one of the musts if you want to run successful business, whether you are selling a service or product. The war for the “first position” or the first page can be really frustrating and in great number cases you will lose the first spot for your desired keyboard to a competitor that has professional SEO Company behind him. The SEO business has grown significantly in the last 3-4 years. Nowadays, there are tons of websites and SEO professionals that offer various services for business. However, there are scams and there are many low quality SEO services that are sold for huge amount of many. In order to spare you from the scams and low quality SEO services, we are going to present you one of the best SEO services for enterprises on the market at the moment. The highly professional team of Extreme SEO is one of the leaders in the SEO business, this year they celebrated their 6th anniversary. We will introduce you their Enterprise SEO package and we will go through their packages and services. Also we will explain how they can help you in building a great SEO strategy. First of all they will surely engage and increase you search presence and logically, bigger and more effective search presence will lead you to increase in sales and profitability. Because, they are experienced in the SEO business they certainly have the needed know how to help you. They can generate relevant customers and analyze, optimize and truly engage and attract your site to all search engines. The organic search to your company’s website will definitely increase. On top of that they offer the most advanced site audit. You will know what are the pros and the cons in your SEO performance. There will be relevant data about your traffic and keyboards. To help you even more the team of Extreme-SEO will create digital marketing strategies for your website. Their team of SEO consultants can design and develop effective, measurable and complete strategies that can reflect on your business SEO visibility and the organic visits from search results. Enterprise SEO includes 3 packages for your company: Optimize ME, Titanium PRO and eCommerce Torque. Optimize ME is basic and it is the perfect package for small business website. It involves advanced site audit, strategic optimization plan, onpage optimization, architecture optimization, offpage optimization and authorship and validation. The other two packages are much more advanced and much broader than the first packages. They are aimed at corporate and e-commerce websites. Extreme SEO offers great customer service as well. They are open for communication, there is live support anytime and you can easily call them or send them an email for any issue or question. At the end of the day, the benefits of acquiring Extreme SEO can be huge. They can truly help you to achieve huge success, increase your profit, image and online presence. ITBots is a an amazing site that will offer you so much great software solutions to improve your business, sales and profit in general. 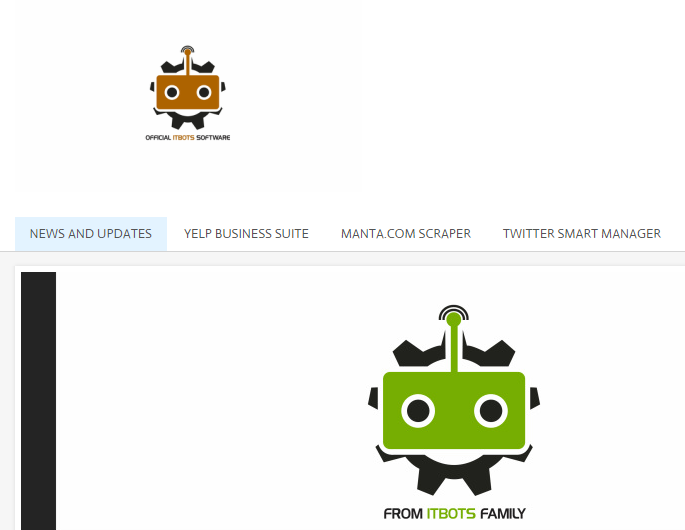 From Manta Scraper to Yelp Business Suite and Twitter Smart Manager this website offers tons of great service that will improve you in so many ways. So, lets go through all the services that this amazing website offers. We at hightechholic have tried all of the services and we must say that all services work perfectly, fast and without any flaws. The creators of the website are just amazing group of highly professional software geniuses. Manta Scrapper – It is a great service that will help you solve Captchas on this website. The system of this website blocks users with captchas in order to make sure that they are humans, one of the 4 captcha services for Manta.com will surely help you to solve tons of captchas with the amazing software that is extremely easy to use. Yelp Business Suite – This is another great service that will enable you to boost your sales, find great contacts and improve your product or service via the powerful website called Yelp. The software will scar business information including: business name, business address, phone numbers, state, city, zip code, website name, Yelp URL. Twitter Smart Manager is another great service offered at itbots. It is a great software that will enable you tons of useful promotional features like auto follow, unfollow, tweets, retweets, favorits, username scarper and even image recognition. Great software for business owners that want to promote their service on twitter. Amazon Scarper Pro – This amazing software will scarp products from the world known Amazon. This will enable you to get amazing tons of information about various products. This software will scrap: ASIN Number, URL of the Product, Product Price and Product Title. Additionally, ITBots offers additional services that could also make you more money online. The AdFly AutoClicker will boost your earnings from this advertising company. Instagram Marketer pro will help you with your Instagram profile and the Fiverr Promotor pro will boost your sales. There are many ways that you can use ITBots, you just need to find what you need. Recently we at hightechholic.com found an amazing website called MyComms. It is a community website that connects volunteers and enthusiasts that want to make difference in their society. MyComms is practically a platform that offers amazing service to people that want to connect in a unique way and that want to build new friendships, contacts and organize events for various causes. MyComms promotes communities and clearly states that communities are the most important part of the society. MyComms is a unique social network that connects people from all around the world that can only benefit from each other. The sign up process is very easy. After that you can start adding friends, creating groups and various events. You can also join any group that you have interest in or visit event that is happening near you. At the moment there are hundreds of groups and I’m sure you will find many that you can connect to and participate in. You can comment and talk with the other members of that group on various topics. MyComms, the power of users that have to organize any type of event through this valuable network. MyComms is one of those websites that have something in it. Maybe it is the freedom, maybe it is the idea of volounteering and communities, but there is something about MyComms that is highly likeable. We will keep our profiles and start socializing and organize various events. Try MyComms here and be sure to contact us for any type of event or group. Companies that offer great value and high quality service will always persist and be successful. That is the case with the amazing CSM South, company that functions more than 30 years in the phone system business. They are specialized company that offers VoIP Telephone and phone systems from ShoreTel and Avaya, but also many other services. The team of hightechholic.com involves writers that have full time jobs at other companies. I decided to do review of CSM South because recently I have experienced amazing service from this Texas and Florida based company. Two months ago I started working for a new non-governmental organization and we needed a new phone system in order to function properly. 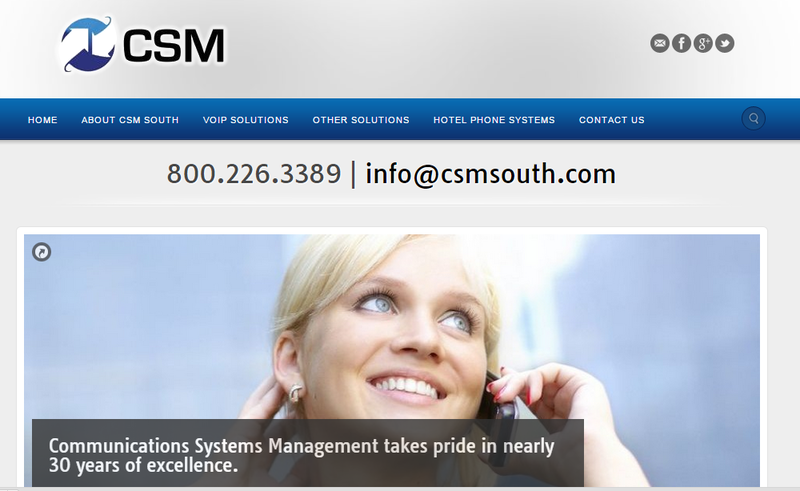 We have contacted CSM South after few of our workers had recommend them. Right from the start our experience with this company was amazing. They were kind and professional and listened to our needs with great attention. They send a team quickly and we used the Avaya IP Office Business System. The installation went great and we are extremely satisfied with everything they offered us. Their staff is extremely friendly and it seemed to me that they care a lot for their customers. In this review I also want to inform you of some of their other services. They offer tons of interesting VoIP solutions that may save you great amount of money and offer you stability. One of their most popular service is the ShortTel VoIP. It is the provider of brilliantly simple Unified Communications (UC) solutions based on its award-winning IP business phone system. Grandsteam VoIP SIP Telephones is another great service that is affordable for any business. Additionally CSM South offers: Voiceware hotel phone system technology, Cloud VoIP, mobility solutions, SIP telephone lines etc. They are highly reliable company that impressed me and that I would hire again with no doubt. Getting discounts is always nice, so we are going to present you one amazing website called Chesapeake Deals. This website offers tons of deals with amazing discounts and offers. Everything is neatly organized and you can easily find deals according to your needs. It is a local website intended for people living in Chesapeake city, Virginia. First of all if you want specific term, you can search it in their lovely, blazing fast and relevant search box. When you find what you searching for, there are numbers, maps, directions and all sorts of different details. But this is only the basic search and Chesapeake offers so much more. The featured item list is located bellow the search box and it involves the hottest deals. I love how you can browse by map (box), map (wide) and item list with map. My personal favorite was Map (Box) because I can easily go through the locals and see they are located, what their website is etc. This is very smoothly designed by the creators. The event list is another great category on Chesapeake Deals. It gives you great presentation of event happening in Chesapeake, but also it gives you deals for companies specialized in organization of events. You will get coupouns and discounts from this companies as well. Chesapeake Deals can be used by both buyers and sellers. You can easily advertise your business with special offers and discounts. There are 3 packages that offer various advertising options. I’m sure your business could really benefit with some of them. As a buyer you can choose from the various discounts and amazing deals of the day. All you need to do is create an account on the website. Additionally you can post reviews to the services you have used so they become more relevant to the future users of Chesapeake Deals. If you live in Chesapeake be sure to check this great discount and coupon website. Christmas and New Years Eve are very close. It is the end of the year when the goals and bucket list for the next year are planned. Well, the amazing iOS app iWish is the perfect app for creating goals and wishes. Not only that, it is the perfect bucket list ideas creator, organizer and inspiration. The lovely iWish is unique because not only that enables you to create your own lists with your own ideas and according to your needs, it also offers over 700 ideas that can be part of your new bucket list. It is the perfect app for brainstorming of goals. You can personalize and edit every goal you set. There is planning and progress tracking, but also setting up deadlines and applying various filters. iWish also offers various visualization features that will make your goals much more compelling and beautiful. You can add location to every trip or goal and even share them with your friends or family via Facebook or Twitter. What we also loved about iWish is that it also contains inspirational quotes that will keep you hyped and motivated. IWish works with iCloud so you can keep all of your goals and wishes synced on all of your iOS devices. Make a wish and set a goal - get it for free on the App Store! There are numerous cloud based solutions for business and organizations. However, most of them are limited to only one or two services. PayTraq is a service that offers multiple cloud based solutions for any organizations or business. Some of the services it offers are online accounting/invoicing, secure storing of financial information and important documents and connecting the accounts and business owners to work together on the important financial documents. Online Invoicing – Quotes, Sales, Orders, Invoices or Credit notes. Basically there are the most used sales management and inventory management tools. Purchasing – You can follow and get clear view of all of your invoices and expenses. The great thing that all is stored in the cloud and it is integrated with the online invoicing i.e with the sales and inventory management tools. Warehousing – One of the best inventory management systems is offered in PayTraq. Of course this is as well integrated with the sales and purchases, but we also need to emphasize that this feature enables multiple locations, products lots and different costing methods. Multi-currency bank and cash accounts – You can easily track and monitor all of the financial transactions, no matter if it is income or expenses. The great thing is that PayTraq support multiple accounts and multiple currencies that will definitely satisfy the needs of the international companies. Accounting – General Ledger, Trial Balance, Journal Report, Account Statements and accrual and cash tax basis accounting are all included in this feature. Reporting – There are reports for your sales, purchases, inventory, money, accounting operations, taxes etc. All in all this is truly an amazing and affordable service. The basic price of the software is $15 and there is also a free trial so you can test all the features we have mentioned here. Try it for free on their website. There are tons of web hosting companies that offer good and quality service. But, lets be real, the most of them are expensive, and even though you pay high prices for their services, very often they don't deliver as promised, they limit the file size and bandwith and their customer services are poor. One of my close friends (owner of several blogs) told me about the unlimited web hosting at Hostwithwill.com. I decided to give it a try for one of my new projects and I'm forever grateful for that advice. I moved from a web hosting that I thought it was the best, but for lower price I got better service and great customer support. Hostwithwill offers 3 main packages. The first is for a single domain and it is called the . This is perfect if you own one website and you are focused on maintaining that particular domain. But, if you want to build sub-domains or add new domains then we recommend you the second package called Little Panda Package. As the first package it has unlimited bandwith and disk space, but you can add as many domains as you want. Our favorite is the biggest and the best package called Big Panda Package. You will get free private SSL and IP, but also a SEO and Social Media support. If you are having health problems, you can go to the doctor or you can read about it on forums or websites on the Internet. That can be helpful, but today we are going to recommend you one amazing website called SkyBlueCross. This website is actually the world’s largest alternative health service platform. It contains tons of useful information, but its main goal is to enable you free consultant service. It represents a free service platform, anyone can join and request information. Also, if you are alternative medicine expert you can join their team. SkyBlueCross is organized in a simple way. The website has Alternative Health Forum on which you can ask questions, or answer them. In the category consulting form, there are different forms that you need to fill in order to get solutions to your health problem. They are divided in different health problems, so I if you are having a kidney problem for example, you need to fulfill that particular form. On the other hand, Sky Blue Cross also offers Video Live Help through Skype. We spoke with a Sky Blue Cross expert while doing this review, and he was kind, open and communicative. He was very knowledgeable and gave us some great answers on the questions we asked him. The website also offers great amount information in the category useful resources where you can find a lot of information about: alternative medicine, natural health, food heal etc. There is also SkyBlueCross Alternative Health Ebook and Free alternative Health Ebook that you can download for free. All in all the website is pretty easy to use. You can find what you need easily and get amazing service. It is perfect if your doctor doesn’t give you useful solutions about your health problems. Even though if you have consulted with a doctor, SkyBlueCross will offer you alternative health solutions that can prove vital for your health and help you. Getting followers on Instagram is a really hard thing to do, especially because the network is becoming more egoistic and nowadays you will rarely get solid following if you are not already popular. That means that if you don’t have a solid number of followers, many people will just pass through your profile and won’t follow you. Our App of the Day called Buy Followers On Instagram will bring you great, solid and quality followers base. Depending on your needs you could get up to 20,000 followers. We have used it here for the 1000 followers, and you will get the followers fast, they will stick (we used the service like 10 days ago and we didn’t see any decrease in the number of followers) and the payments are done very fast. You can buy the Instagram followers via PayPal or via your Credit/Debit cards. So, get thousands of followers fast and in a secure way with the app Buy Followers on Instagram. The app is free and available on Google Play. GET Binary is a website where you could perform binary trading on various assets. It is a website where you could make great amount of money if you are smart, know the market and invest the right amount of money at the right moment. After you open the account, and the process is very easy, you could start trading with currencies, stocks, commodities and indices. So, one example of binary trading is for example between the value of the Euro and the USD. You could chose that in a certain period of time, period of time that you will chose, that the value of Euro will increase to the Dollar. You can choose between 30 seconds and 5 minutes. This is great if you are looking for excitement and quick turnaround. I have made around $30 in just few trades and I must say that there is huge percentage of payout. You can do the similar thing, not only with Euros and Dollars, but also with the Japan Jen, Canadian Dollar, Australian Dollar etc. However, as I stated before you will get the same binary trading options with stocks, commodities or indices. For example you could do binary trade with the stocks of Google and Apple. Another tool that GET Binary will offer you is the auto chartist analysis, which will provide you with useful information because it provides research on short-term market movements. The social trading is also a great tool to see how and where the other users of GET Binary are earning and what are they trading at the moment. The customer support of GET Binary are just amazing. They are really helpful and they communicate not only with online chat, but also via telephone. At the end of the day I have withdrawn the money I have earned. My trading experience was great and I will definitely continue to trade on GET Binary. My overall impression is that it is an easy and fast trading, with excitement and high payout – simply a profitable and joyful binary trading experience. Having a personal security is one of the best solutions to achieving safety in a lot of situations where you just need help and you just don’t feel safe. EmergenSee will enable you just that. It’s an app and service that will enable you to contact family, friends or professional 24/7 monitoring. The EmergenSee App is a great service so we are going to review what they offer. This service is based on two app versions for both Android and iOS devices. You can download the appropriate app for free and use your friends and family as contacts. The apps are extremely professionally done. They will enable you tons of useful security features. You can live stream videos through the app, with audio, GPS location and movements to all of your pre-selected contacts. You can do this when you are in seriously dangerous situations or if you’re witness to a crime. There are some additional features that I need to mention. The app will pinpoint your GPS location and track your movements during an incident. Additionally EmergenSee will record your incident discreetly even though the screen of your smartphone appears off. Also, there is instant messaging with your contacts, there’s a timer for alerts and even mass broadcast to an entire network. This will definitely keep you safe. This App is available for free and lets you send this alert to your own circle of 3 family / friends - meaning If you have trouble and need help the 3 personal contacts will receive your distress video and GPS locations and they can either call police or come help you themselves (depending on the situation you are having at that time). But the professional monitoring paid service will get you some top quality and extra care with secure monitoring. This extra care means that you will have security agents who will communicate with you until your situations is resolved. The professional monitoring centers are equipped with dedicated around the clock security agents. They are professionally trained and there to assist you 24/7. If you are in some kind of dangerous situation using the video and your GPS location your agent will locate and dispatch the closest responder to arrive immediately. Actually, the nearest first responder team will arrive completely ready to help with your situation. Whether you need police, fire or ambulance the professional security operators will help you get the appropriate assistance. The professional monitoring paid service is by far a better solution than the free service. However, at the end of the day, EmergenSee is a great app to have on your mobile devices, app that can help you and your family to feel safe. 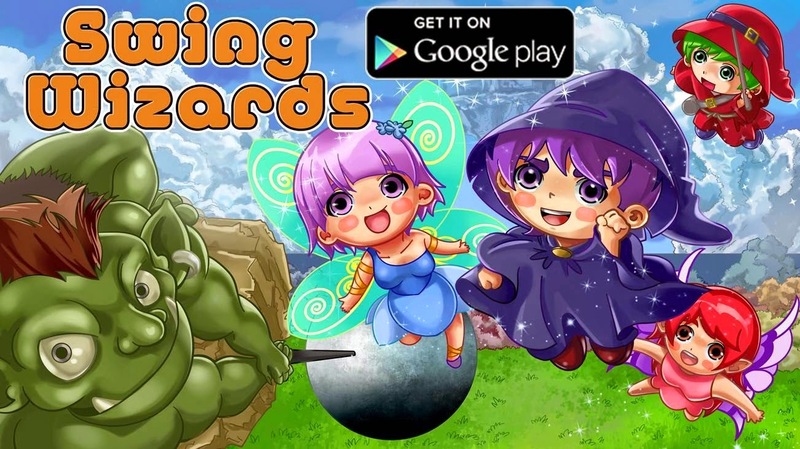 The colorful, anime cartoon inspired game called Swing Wizards is our Game of the Day. It is an outstanding casual game that is filled with interesting and existing moments. The main characters are the lovely swing wizards that are drawn perfectly. There are a lot of obstacles that will try to stop you from flying. The gameplay is simple, it just simple tap-and-play gameplay that is easy to play and that makes the game addicting and interesting. The anime wizards and the stunning HD graphics, together with the lovely design and drawings are making Swing Wizards great gaming experience. I could literally play this for hours. First you need to develop your skills, because that will be key for you to pass through the challenging moments the obstacles will cause you. Try it for free on Google Play. Crystals Black Jack: Speak English is an extraordinary education app that will improve your English in many ways, but mostly it will learn you how to think and speak in the English Language. Created by the professional linguist Alexander Pavlenko, it is an app filled with interesting stories, excercises and examples that will not only represent an effective way of learning, but also a fun way of learning. 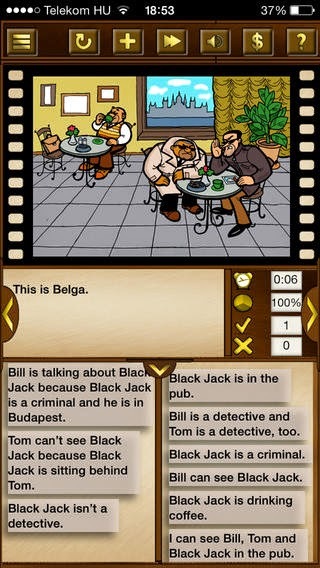 The app is interactive and it is based on a story about two detectives, Tom and Bill. There are several steps and chapters, and after you finish them you will be able to speak English fluently. The tasks are very effective and smartly written and the drawings are cool and appropriate. Crystals BJ: Speak English is a great education app, that can serve as an example to other education apps. The excellent free Puzzle game – Puzzle Maniac-Logic Problems is our Game of the Day. It is an excellent puzzle game that consist tons of mini-games that will activate, train and test your brain and thinking skills. Puzzle Maniac has 4 series. Each series contains 7 levels, but the developers are working hard in creating new levels constantly. As you progress through the game can become hard and challenging, but that is the best thing about Puzzle Maniac. It is the true test for your brain. The game has simple UI and lovely gameplay. Everything is responsive and fast. People who love brain and logic games will adore Puzzle Maniac, especially because it contains: mental, logic and math minigames. 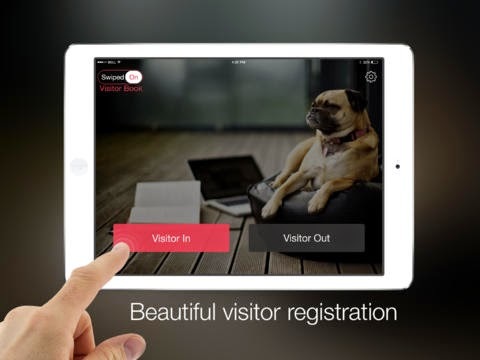 Visitor Book is extraordinary app that will enable you amazing visitor registration on an iPad. Get rid of the papers and expensive systems, just use a free app for simple visitor registration. Most of the companies and offices want to keep track of the visitors that come and leave their offices. Keeping a paper or documents on a computer is an old fashioned way of keeping record of your visitors. Another way are the complex gadgets and electronic systems that can track the visitors with cards or different devices. Recently we have discovered an excellent solution for keeping track of the visitors of your office. It is a modern way of doing things and method that will save you time and improve your company’s image. We are talking about the iOS app – Visitor Book, that without any hesitation we pronounce as App of the Month. It is an iOS app that not only will help you in the visitor registration, but will also enable you tons of other useful features that will improve your productivity and visitor management. We are going to list all the features bellow. Visitor Book is a professional and quality business app that is perfect solution for every business or organization. With its functionality, features, design and flawless UI it is surely one of the best apps in the business category on the App Store. Try it for free, it is available for iPads with iOS 7.0 or later. 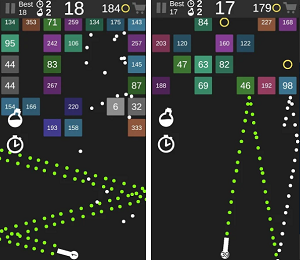 Dot Wave is fast paced, but excitingly entertaining action game that you will surely love. Packed in modern and urban design, with great sound effects and cool female voice over, Dot Wave will challenge you to stay alive through the dynamic waves. To make the things more challenging and entertaining, everything runs fast and the background can change its direction and dimension in any time. The game is integrated with Google Play Games, so you can compete with other players as well. I like Dot Wave, it seems that developers have put a great effort in creating something unique, urban, challenging and entertaining and indeed they did a great job. Try Dot Wave, it is free and available on Google Play. Today we are going to present a very useful and unique service that will enable your kid a better development. The web apps of MaxSchollar are indeed one of the best in the business. They produce e-learning web apps that are effective and already tested. MaxReading and MaxPhonics are surely one of the best services they offer. Maxphonics uses the Orton Giligngam Method. This method teaches the students the letters of the alphabet and then it uses the correct pronunciation of each words. The web e-learning app then uses auditory, visual, kinesthetic and motor exercises to improve, test and bolster the knowledge of the students. The exercises are divided in several worlds and you can follow the progress of your students. The exercises are thorough and they include the student to pronounce letters and words in order to progress. Maxreading is a program that will improve and master the reading comprehension. It uses the highlighting, summarizing and outlining a text as it main concepts. It is consisted from 13 levels. Each level is consisted from several topics and each topic is consisted from various short educational stories. The goal is the student to mark the topic, the main idea and the details with the blue, green and yellow marker. That will improve his understanding and thinking, as well as his knowledge of the grammar and spelling. Maxscholar also includes tons of other programs like: maxmusic, maxvocab, maxplaces, maxbios etc. It is the perfect place for students and teachers. You just need to make an account and everything else is free. As a freelancer myself, I get all my work done on a laptop or PC. Very often I get stuck on distracting websites like Facebook, Twitter and YouTube. I don’t do anything special, I just stare in the screen to see if there is anything new or interesting, while I simultaneously work on an article, project or some design. This is draining my time and ruining my productivity. Well, my life completely have changed with Focus Now. FocusNow is a productivity app for Windows that will enable you to block the sites that are taking your attention. Actually you can block both, online and offline distractions. Using the different modes, you won’t be able to access your favorite websites and programs. This will make you to focus on the task you need to get done and it will definitely enhance your productivity. Focus Now is extremely easy to use. There are 3 different work modes. The first one is called Work Block Mode and it will enable you to block websites and apps for a specific amount of work time. The Pomodoro will enable you breaks at 25 minutes (you can change this in Settings) intervals, all with the simple goal to relax and rest. The Schedule will give you the ability to set your own schedules depending on your work rhythm and duties. The app is light, easy to use and it is packed in a small Window that you can easily control. When your time of blocking the apps and websites expires, the app notifies you instantly. Focus Now is great idea with the perfect realization. I am sure that many people who get their job on the computer will appreciate it. FocusNow is a small, but very powerful tool that can boost your productivity significantly! There are tons of software products for back up of Mac. Even the Mac itself has a built in back up software that will spare you from unpleasant situations, like losing important data. However, the software we are going to present you today – Weisoft’s MAC Time Capsule offers unique feature – it will back up your Mac to a Windows based PC. There is no limit on how many backups you can do, meaning you can control and back up multiple devices. You can start using MAC Time Capsule in 3 easy steps: download, install and run. The software has built-in AFP support and it runs very fast. Another great thing is that it supports basically any Windows, from XP to Windows 8. There is also access privilege control. The whole software will enable you high data security and it will enable you the use and transfer of large files (larger than 2GB). It requires very modest hardware requirements: 1GHz processor, 256MB RAM, 100MB free space and 256MB graphic card. Check out the detailed product introduction here. If you get stuck on the installation, or you have some other issues, there is the excellent Weisoft customer support team that is always there and ready to help. So, get rid of the Apple’s expensive “Time Capsule” and try Mac Time Capsule. It has extremely affordable prices until October 1st. The great thing is that you will get discount for purchasing other products from Weisoft, if you buy MAC Time Capsule. If you are in search for easy to use and quality HTML5generator, then stop, because My Sections is one of the best in the business. It is perfect for web designers that want to create something quality and interactive with basically no effort at all. It can be used by businessman as well, who want to create interactive content that later will be used in various ways. My Sections will enable you to create interactive graphics very fast and it will work flawlessly on any of the modern browsers. Any content you create has responsive design, meaning it will be optimized for any device. The graphics will be compatible with any mobile devices and there is no Flash, only HTML5, so there will be no interference with devices that don’t support Flash. Of course, there is both video and image support, which gives you endless possibilities. The site is called my sections because when you create your interactive content, it will be contained from different sections you create. You can easily add media and create endless number of sections. There is a preview feature and you can easily publish anything you create. The site is perfect for realtors because they can create interactive plandraws of the real estate they sell. For example, if you sell an apartment you can draw it in 3D and create and add pictures of every room that will be shown the user clicks on a certain room. The great thing is that it works on tablets as well, where the drawings look stunning. Any work you do on My Sections is stored on the cloud and you could easily continue with the creation of your content anytime. My Creation is simple, easy to use, offers great features and because safe, because any content you create is stored on the cloud. Excellent service! So, you bought original DVD from the movie or TV Show you wanted to watch, but you want to also be able to watch this movie on any all of the devices and gadgets you own? Then you should try the outstanding Wei-soft.com DVD Ripper Platinum. It is an extraordinary, easy to use software that is filled with great and numerous features. It supports conversion from DVD to basically all of the video and audio formats. So, you can convert your DVD movies to AVI, MPEG, WMV, DivX, MP4, MPEG-4, AVC, MOV, 3GP etc. That means that your movies will be playable on your iPod, iPad, iPhones and even Zune and any other playback device. It will enable you to play DVDs on phones like Nokia and Blackberry as well. All this is done in amazing speed, remember that! Another great thing about Wei-soft.com Ripper Platinum is that it also comes with great editing tools. You can clip, split or merge videos and even crop the video frame and adjust image effects. There are tons of other effects too, which again proofs the versatility of this quality software. You can post your videos to YouTube or Vimeo using its great editing and conversion software. The user interface and the software are clean, simple, fast and easy to use. Here you can see more about how to use it. Remember, you will convert anything in a glance and you will do that with no errors, glitches or lags. The DVD ripping with Wei-soft.com Ripper Platinum is 5 times faster than the normal home DVD ripping. Wei-soft.com DVD Ripper Platinum is one of the best software that I have ever used. It is great for conversion, ripping and video editing. It is blazingly fast and extremely easy to use. Amazing! While I was browsing Google Play I found one new and entertaining game called Run Freddy Run. This arcade game has quickly grown on me and I can say that I’m fairly addicted to this simple, but yet outstanding game. Based on a 2D platform, the game requires from you to avoid all the obstacles and run as far as you can. Obstacles come in the form of walls, bees and trunks. Run Freddy Run has neat graphics, fun main hero – the teddy bear and entertaining gameplay. The game is addicting as well, I always try to beat my high score. The game has all sorts of different power ups that will speed you up and smash your obstacles. The game has great average rating of 4.8 on Google Play from over 100 reviews and I predict great future to it. Run Freddy Run is free and available on Google Play. If you love customization and personalization apps, they you will surely adore Weatherback Wallpaper. It is simple and easy to use app that will be great addition to your current Android wallpapers and themes. The app will enable you to display and use different weather effects on your screen, including: rain, ice and clouds. Weatherback Wallpaper can also automatically change the weather effects depending on the weather on your current location. The app will show perfect HD rain drops on your Android device if it is raining in your city. But you can also opt out from this feature, and select only certain weather effects. Another great thing is that this app has really low levels of battery consumption, unlike other similar apps. I have used it over the last week and according to my battery statistics it used only 1% of my battery and it was at the bottom of the list. Weatherback Wallpaper is another great example of a cool, easy to use and neat personalization app. The app is free and available on Google Play. Flick Chick is excellent 2D game that you can enjoy on your Android devices. Its integration with the newest Android version, Android KitKat 4.4, make the game available to the newest smartphones and tablets. Flick the Chick is great adventure game in which the main hero is the blue and cool looking chick. However, even the gameplay is simple and you can easily navigate the blue bird, the game is relatively hard and it requires certain level of good skills and technique. That makes the game interesting and competitive. The goal of the game is to pass through the yellow circles that have different position. The interesting sound effects make the game even more entertaining and relaxing. I love how you can play Flick the Chick with one hand. It is a great time killer that I believe will achieve great success on Google Play. Try Flick the Chick, it is free and available on Google Play. Captain’s World is new Android game that I’m sure you will enjoy. I have been playing it in the last few days and I’m totally addicted. Its simple gameplay, crisp HD graphics and the interesting worlds you need to save are amazing. One of the reasons I’m hooked is because Captain’s World is really challenging. Basically it is one of the most challenging games I have ever played. The goal is to pass all the levels and get the highest score as possible. Of course there are obstacles in form of trolls and holes which you need to avoid. There are also coins that you need to collect and that will help you to increase your high score. Excellent game that you need to try out! It will keep you glued to your Android devices, because it is interesting, challenging and entertaining. If you like simple and easy to play games, that are also entertaining and challenging, then Doughnuts in Space is surely the game for you. Created by enthusiastic team of developers that want to keep thing as simple as possible, Doughnuts in Space is great time killer that will give you fun and interesting times when you are feeling bored. The gameplay is simple, it is an easy to play tap game. The goal is to tap the donut that is selected in the toolbar located in the top. You get 3 lives to pass through the levels, and there is also some help, in the form of UFOs and spacemen that will give you extra lives. I liked everything about Doughnuts in Space and I think that every game developer should follow the example of this developers. Dougnuts in Space is great game for all ages that will relax you and that you can enjoy with one hand. Try it now, it is free and available on the App Store for devices with iOS 7.0 or later. Browsing through the App Store I recently found Cat and Kitten Sounds - fun and entertaining app that contains over 40 realistic, high quality cat sounds. No matter if you want regular meow sounds or funny sounds, your cats or other pats will react epically to any sound you pick. They don’t expect your mobile device to produce such a crisp and realistic cat sound. I really loved the graphic interface and the speed of the app. It is easy to use and up to the point. I have messed around with my cat and rabbit. They make awkward faces when they hear the regular meows and go crazy if I play them the angry cat sounds. I also love the purring sounds. You can use Cat and Kitten Sounds to mess with your friends or family as well. 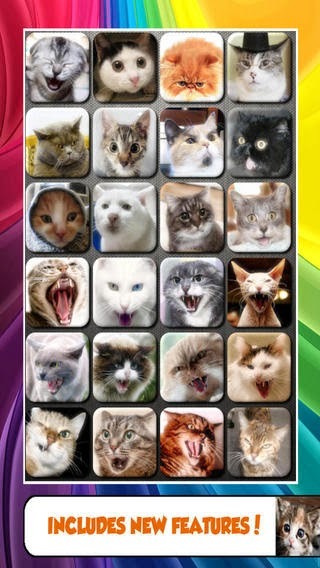 It is truly a great app to have if you love or have any kind of pets in your home. Try it, it is free and it is available for devices with iOS 5.1 or later. Blade of Goddess is exciting, dynamic and just amazing Android game that blew my mind recently. 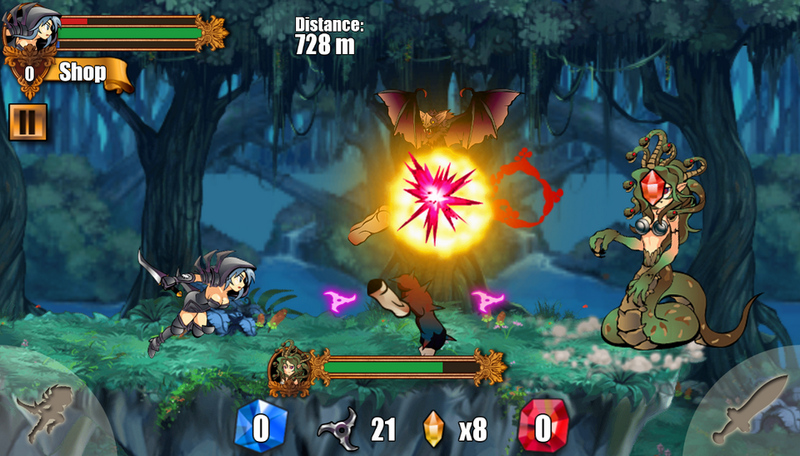 This arcade adventure is 2D game that includes tons of excitement, fights and enemies. The game play is addicting and it will definitely glue you to your Android devices. Blade of Goddess is basically endless running game. You need to defeat your enemies using jump, blades and other various weapons that you will collect throughout your run. Your super hero is the black goddess ninja that runs powerfully and needs to fight against all obstacles. You control the weapon with taps on the right bottom corner, while with taps on the left bottom corner you will jump. The goal is to stay alive as far as you can. All sorts of different beasts and monsters will try to kill you. The blue and red diamonds will help you to get energy and pace. You will also get clear view of how much weapon you have left. Besides the monsters and all sorts of different enemies, the dark night includes evil snake women monster which is so hard to pass. The graphics of this game is just outstanding. It is one of the best I have ever experienced on an Android game. The great thing about the graphics is that it doesn’t take too much RAM memory. That means that you can run Blade of Goddess on mid-range Android devices with no-problem at all. The sounds are also great, they take you in the spirit of the night and they create interesting dark ambient. Blades of Goddess is one of the hottest games on Google Play at the moment. You should try it. It is addicting, interesting and it will stun you with the game play and graphics. Creating a good and high quality affiliate marketing website is a really hard job. If you want to be successful, your articles must be SEO optimized and must be high quality. If you are a talented writer that wants to write the articles by himself, go ahead, but the reality is that you can’t do that in the volume and the pace needed to succeed. Sometimes you will need articles that are good and SEO optimized, but that are created with basically no effort at all. That is why today I’m going to present you one service that will help you to create incredible affiliate and SEO optimized articles in a glance. Amaze Discover Post is the perfect amazon affiliate script that will create you high quality posts and articles. It is easy to use, affordable and really helpful. It can only bring you money and visitors to your websites. Amaze Discover Post works in extremely simple manner. There is no need to install anything, you just need to submit your keywords. Then it will extract information from Amazon product descriptions and reviews and it will get content from other high reliable sources like Yahoo answer and Ebay. Then after that short process, it will auto create posts, which you can directly post on various platforms like Wordpress, Blogger or even Facebook as a note. All posts are scrap from Google as well. You can also set up publish frequency and set up the category of your posts. It will also enable you to auto-comment on posts so your site looks legit, popular and reliable, which eventually will lead to more sales. All of the articles are unique, easy to read and the great thing is that you can manually modify them in order to make them perfect. You can try Amaze Discover Post for free, but you will be able to use it for only 2 days. The monthly rate is $15, which is nothing when compared with the money it can earn you. Dennis L. Binder, Jr. is experienced small business owner and writer. He is creator of the website Derbinventures Publishing and author of Does God Love the Wealthy More Than the Middle Class? He is a talented publisher that makes his case regarding the important issues, by referring Documented facts & official Government data. The website contains some interesting thoughts about the taxation of the wealthy and the income of the Middle Class and Working Poor. All this information serves as a preview of the excellent book I mentioned earlier. According to the Dennis, taxing the rich businesses harms the middle class and working poor. This seems quite logical, if you think it through. If the taxes are increased on the wealthy business, then the price of their products and services will increase. That is how the Middle Class and Working Poor suffer the most. It have never occurred to me that the excessive taxation promotes income inequality. As educated and experienced middle class citizen he researched and came to some other interesting and constructive conclusions. For instance he also thinks that tax cuts can stimulate the economy and create more jobs. This and much more is included in his book that you can by here. It includes tons of other economy, jobs and tax related topics, views and thoughts. Derbinventures is not the characteristic American publisher. He don’t want to sell his product to the wealthy people, but instead, he wants to help the middle class and the poor in understanding their power and how they are harmed by the government and the greedy entities. His book definitely changed my point of view in many economy and political topics and basically opened my eyes. Give it a try! Inflatable products can be used in many various ways. They are objects that can be inflated with a gas, usually with air, but also with hydrogen, helium and nitrogen. 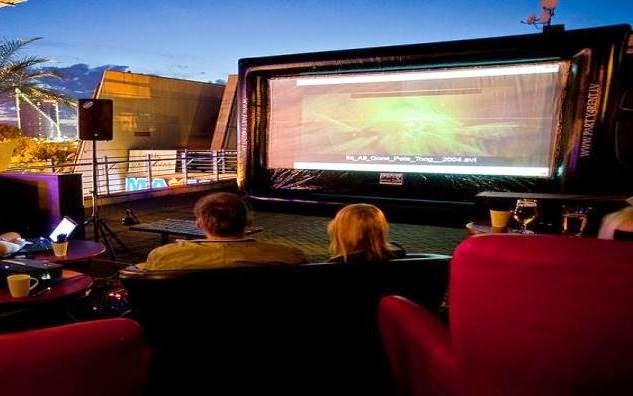 Today we are going to present you the amazing outdoor movie screens (inflatable) that can be used anywhere and by anyone. The inflatable projection screens can be set in your backyard and be enjoyed by your friends and family. 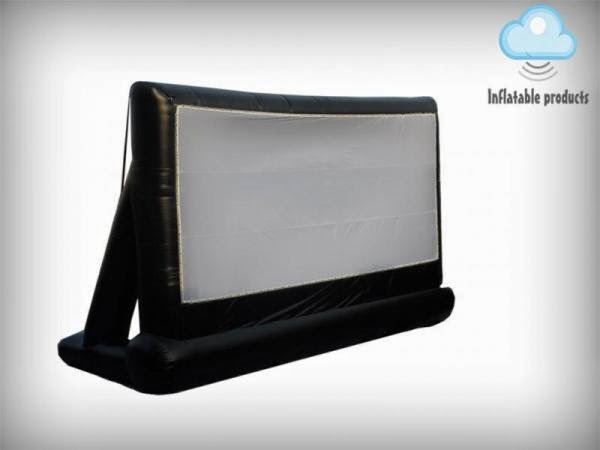 The best store for any inflatable products is definitely Inflatable Screen from the United Kingdom. Experienced in this business, Inflatable Screen will offer you various inflatables, including: inflatable project screens in various sizes, inflatable LED advertising tubes, water blobs, inflatable fly fish and water trampolines. All these products can be used in many different ways, for private, but also for business use. With small investment in one of these products, you can easily earn money selling all sorts of different services or promote your company in compelling and impressive way. The inflatable outdoor movie screens are really great product. Imagine you set up outdoor movie screen in your yard. You can watch movies with your loved ones or maybe follow some big sport event with your friends, like the World Cup for example. The possibilities are limitless. You can also use this projection screens inside your house. These inflatable project screens are totally waterproof. The screen frames are made with tarpaulin and the projection screen is made of oxford cloth or PVC. All projection screens come with electric blower/fan and durable carriage bag. You will get one year warranty and also there is a possibility to include your company’s logo on it. Depending from the size, they weight from 100kg to 600kg. Inflatable screens give amazing viewing experience. You can easily store them when you are not using them and you can use them and transfer them wherever you want. Go at Inflatable Screen and find the right size and screen that will satisfy your needs.